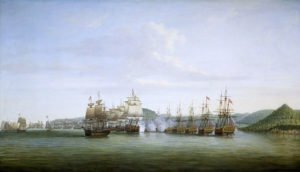 Uppleby was commissioned lieutenant on 9 November 1756 and amongst other service he was aboard the Valiant 74, Captain Adam Duncan during 1763-4. Having been promoted commander on 2 June 1772 he joined the Hawk 8 in the East Indies, which vessel was paid off in April 1775. He was posted captain on 8 April 1776 and flew the broad pennant of Commodore William Hotham aboard the Preston 50 going out to North America in May. After commanding a division of boats in the landings on Long Island during the New York campaign of July – October 1776 he was present at the occupation of Rhode Island on 8 December 1776. When the bulk of the fleet undertook the Philadelphia campaign in the autumn of 1777 the Preston remained with Hotham in the Hudson River supporting Lieutenant-General Sir Henry Clinton in an incursion into the Jerseys with Uppleby leading the debarkation. He was still holding his position with Hotham during Vice-Admiral Lord Howe’s fleet in the defence of New York in July 1778 and in the manouevres off Rhode Island during August where the Preston famously attacked the storm-damaged French Marseillais 74 before being obliged to disengage on the approach of other French men-of-war. At the end of 1778 the Preston sailed under Hotham’s orders with a squadron conveying five thousand troops to the West Indies, and she fought at the Battle of St. Lucia on 15 December. The Preston remained in the Leeward Islands during 1779, and was present on 18 December when the fleet successfully attacked a French convoy. In 1780 Uppleby commissioned the recently captured French frigate Blanche 36, but she was lost at sea with all hands off Antigua during the Great Hurricanes of October 1780.